FreeHDL 0.0.4 is a remarkable VHDL compiler. It takes VHDL files as input, parses them, and outputs an executable binar. This executable serves as a simulator. Instead of commercial software like ModelSim it does not utilize a gui itself. Instead, it relies on VCD as output format. 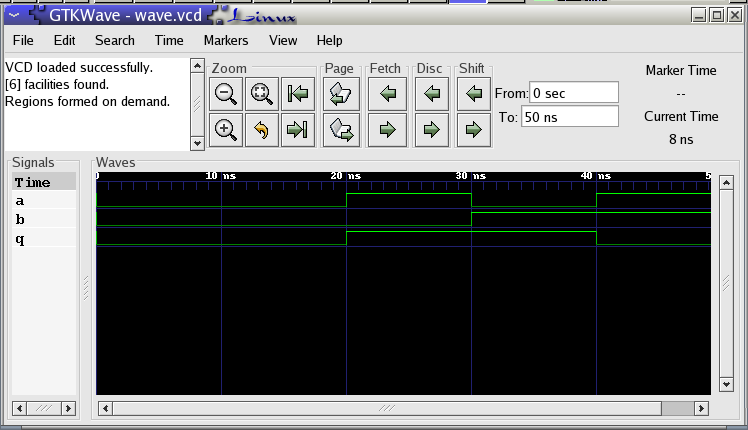 Hence the users needs an external waveform viewer to analyse the output. GtkWave is a tool capable of doing just that. Assuming that you have already compiled and installed freehdl and gtkwave, this mini-howto will present a simple example on how to write a VHDL-file, compile, simulate and analyse it. Replace every /usr/local/ with the path you have installed freehdl in. Hint: Instead of typing in everything at the shell it is smarter to save those commands in a skript-file. If everything works out as planned, you should have an executable easy. You should have a file called wave.vcd by now. when trying to compile the kernel/main.cc file. message. And finally, I'd like to give you some simple vhdl examples. You can run all of them through freehdl. - easy.vhdl A simple vhdl-file. - ramcell.vhdl An example that shows how to generate RAM or memory.